Feet brace the ground, as biceps struggle to move even an inch of the solid earth before you. You grit your teeth and push with all your might, and slowly but surely you begin to inch up the hill. But as you reach the top, thinking it apt to take a break, you watch in horror as the boulder plunges downward. Your heart sinks as you realize the only way forward is to bring the boulder back up again. 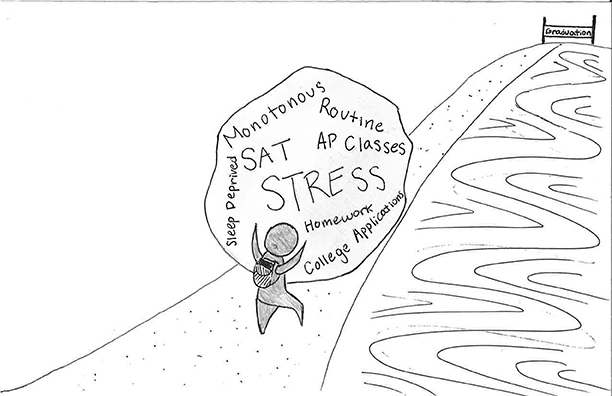 Though it seems like I am relaying the fate of Sisyphus as described in “The Myth of Sisyphus,” I am more aptly describing the plight of high school seniors as they near the top of the hill again. Our lives as students of the American education system has been consistently filled with the mundane task of pushing a boulder up a mountain. Elementary school, middle school, high school are full of all boulders we’ve pushed. But this time is different. This time, the boulder won’t fall down the same path. The 13 years of our primary education has created a routine for us, a consistent system some of us have learned to deal with. “The Myth of Sisyphus” details Sisyphus’ eternal torture in the underworld, pushing a boulder up a mountain, only to watch it fall each and every time. Through this damnation, Sisyphus is described to find joy, despite knowing his eternal fate. You could say we are the same: we find joy despite knowing we are constantly pushing a boulder up a mountain. Now I don’t exactly mean to equate our education system with futile and menacing physical labor, but I do find similarities in the mundane tendencies of both. Through this tireless routine, we have found our joys. The boulder has fallen before, but this time it feels different. I don’t know what I’m supposed to be pushing. The consistent path is fading, and for once, I have the privilege (and disadvantage) of choosing my own path. And yes maybe I am just an obnoxiously dramatic teen who pays a little too much attention in English class, but I’ve been doing a lot of big question thinking lately; pondering the meaning of life, the purpose of my existence, you know, the easy stuff. Maybe I am overthinking everything, but it is through this myth that I face my own reality. So if I can find any sincerity in this scam of relaying a life’s worth and esteem in one crafty, convincing, unique, original, intelligent 250 word essay judged by a person I will never meet, it is this: your truth is waiting to be spoken and only you can tell it. You will never stop pushing up boulders, even in pursuit of freedom from routine. So the sooner you can learn to find simple joys, the better.